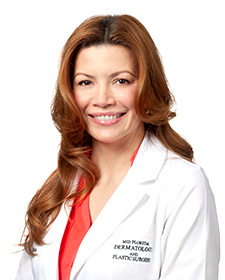 Dr. Mariela Salinas is fellowship-trained dermatologist with a board certification in family medicine. She completed her dermatology fellowship at the University of Texas Health Science Center of San Antonio, under the direct mentorship of the renown physician, Dr. Richard Usatine. Dr. Salinas’s fellowship program was designed for family physicians, who wish to develop expertise in the full range and depth of medical and surgical dermatology. Prior to the fellowship, Dr. Salinas completed her family medicine residency at the University of Texas Health Science Center in El Paso and received her MD from the National Autonomous University of Nicaragua. She is committed to providing a high standard of medical, surgical, and cosmetic care to both adults and children and is fluent in both Spanish and English. Dr. Salinas is a member of the American Academy of Family Medicine, the American Medical Association, and the Florida Medical Association.